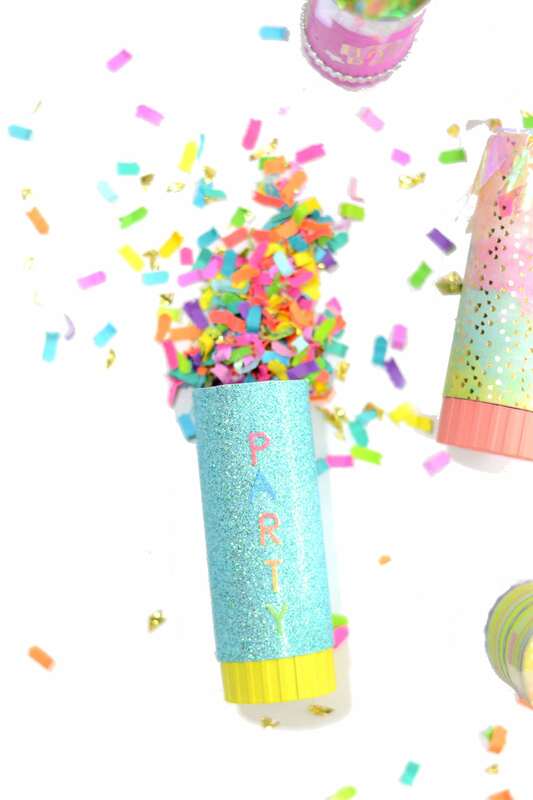 Ok, I’ve done it — I’ve figured out some magical confetti poppers for you guys that actually shoot confetti out all sorts of crazy-happy-like, AND you can even reuse them if you want to. Hot diggity dog! 3. Now, as you’ll see in my video, if you don’t mind a black “twisty part” (technical term) of the popper, you can skip right to hot gluing a piece of colored paper to the tube. But if you want to jazz it up with more color, you can coat the tube in some white spray paint primer, then spray paint with any color you’d like. Then you can embellish further with colored paper and/or stickers. 4. 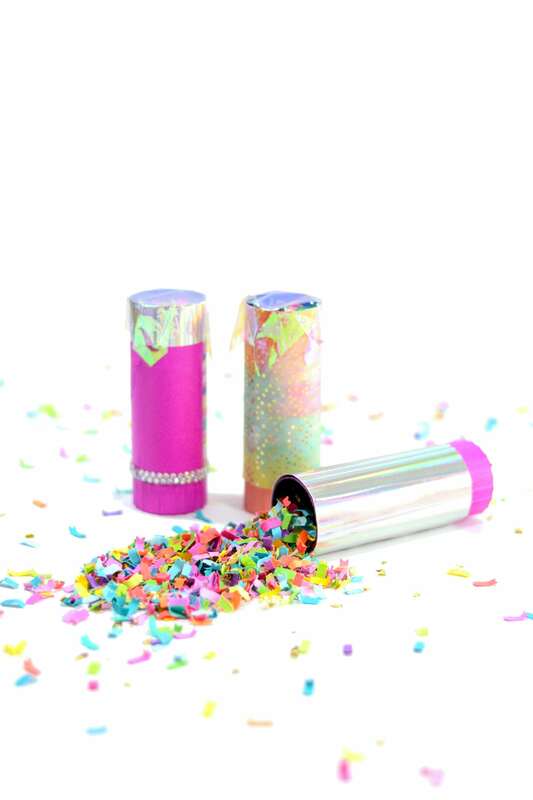 Fill up the top of the tube with your #TheConfettiBar confetti magic, cover back up, and ta-da! A MUCH prettier and happier confetti popper! *In terms of how much confetti fits in a popper, I found I could easily fill about 10 poppers per cup of confetti. (About a TBSP is perfect, and there are approx. 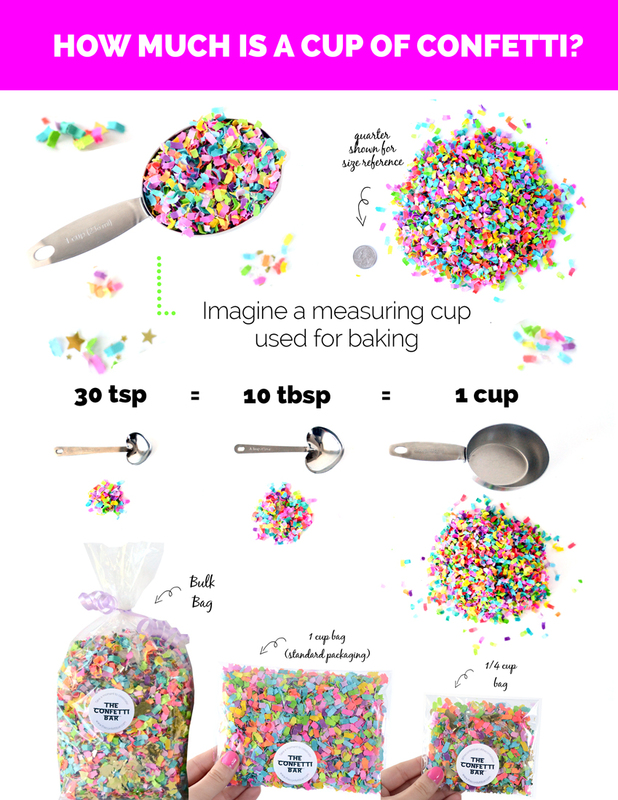 10 TBSP per cup of #TheConfettiBar confetti.) Small shapes will fit nicely as well, but some larger custom confetti pieces might not fit depending on the size. Just something to keep in mind. Decorating is my favorite part! Washi tape, stickers, and jewels are all fair game! You can get super custom for various events by using sticker letters, or even going old school and doodling with some markers. The key with any method you choose to close these is that you want it secure enough to keep the confetti in, but flexible enough that when you release the spring it can break through to send your confetti flying! If you plan to use one for a gender reveal, you’ll definitely want to use a paper circle or opaque tissue paper so you can’t see what color confetti is inside! There are so many options for matching a particular event’s style or theme, and these would be great for corporate / business branding events & celebrations, too! And of course these would be fabulous for weddings, bachelorette parties, and/or bridal parties! Our Cheers! mix makes a great choice for a classic color combo since it’s black & white with gold champagne glasses. For a colorful mix, Unicorn Party is always a popular choice! 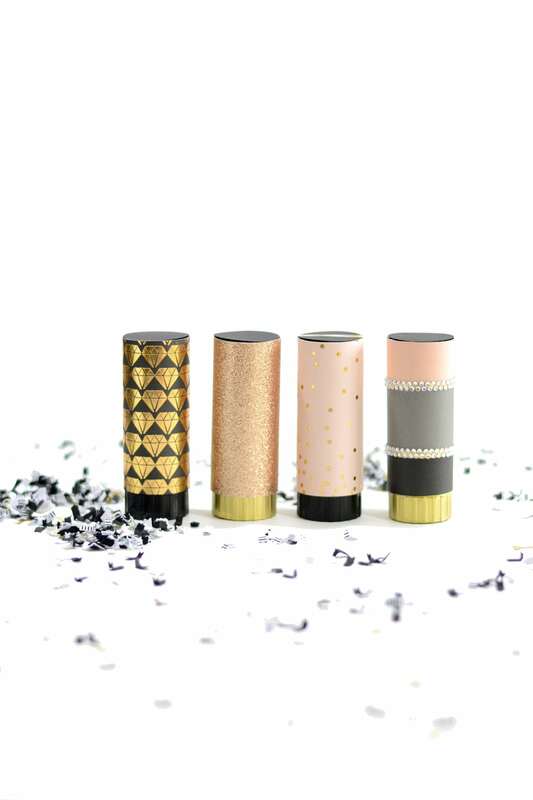 And of course custom colored confetti is the best way to get exactly what you’re looking for! But any way you slice it — no matter what colors or embellishments you choose — I think it’s safe to say these will definitely take your celebrations to the next level of happy and fun! 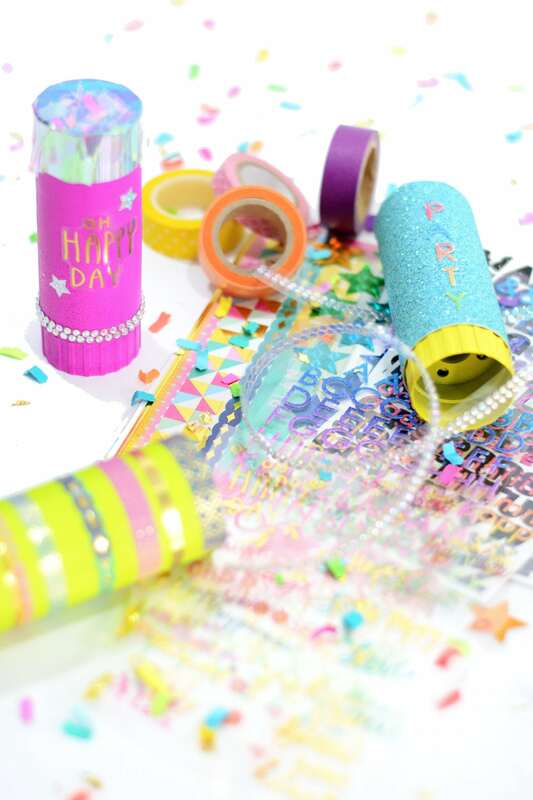 Just remember that to release the confetti, you want to grip the middle of the tube in your left hand, and use your right hand to twist the bottom “twisty part” (yes, again that’s the technical term) counter-clockwise. Now I will be the first to admit that when I got these to try out, I was terrified of setting them off. I’m not generally a fan of things popping (i.e. balloons), but I knew I needed to take one for the team. Turns out these little 1.5″ poppers are nowhere near as scary as I thought they would be, but please exercise caution when using them as the spring mechanism can still be pretty intense.